Ann I Am! : @Duraflame Campfire Roasting Logs--LOVE 'Em! 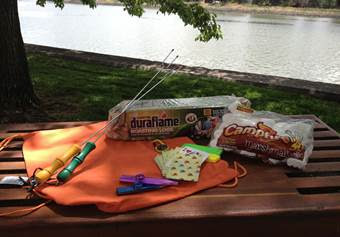 @Duraflame Campfire Roasting Logs--LOVE 'Em! Disclosure: I received a package of firelogs, roasting sticks and marshmallows in a carry bag to facilitate this review. In addition, there were a few trinkets for the kids. As always, this review contains my honest opinions. Summer is my favorite season. I love the warm (and even hot) weather. I love the long days. In fact, summer evenings are my favorite time of day. And there is nothing like relaxing around a campfire. And being a serious camper, I have spent many a night around the campfire. As we often travel to different states to camp, we are unable to bring firewood from home (state laws to prevent the transmission of devastating bugs). Of course, we can always buy firewood at the campground or along the roadside, but we have found that it is just as easy to use the Duraflame Campfire Roasting Logs. These logs are designed just for use around the campfire and have been tested for safe cooking (other fire logs are NOT safe for cooking over). These logs are made with real wood charcoal and are very easy to use. Simply take two or three and light the package they are wrapped in. Within minutes, you are ready to roast your marshmallows for a delicious S'mores. And while on the topic of S'mores, have you tried using a Reese's Cup instead of a Hershey bar? Out of this world! These logs aren't reserved for the campground campfire, either. They are great to use in a fire pit as well. The other great thing about the Campfire Logs is the price. They come four to a pack and my Kroger sells them for $5.49 (about the cost of a bundle of wood). They are much easier to haul around and burn just as long. If you print off the $3.00 off coupon, you will really get a deal! Reeses cups on smores?!?!? Yum! I think we may need to have a campfire this weekend! These look like they would be perfect for those quick campfires! Oh my goodness.. This is not something I should be reading when I should be going to sleep!!!! lol My cousin loves these logs for his fire pit! And the price is great too! I was just trying to think of something to get him and I bet he would love some of these :D So glad I saw this post and you reminded me! My friends and I just burned duraflame logs in an open pit fire! We made smore’s and hotdogs and sat around enjoying ourselves. I was surprised at how long a log burned, too. 4 hours each is a long time! We’re gonna do it again soon. Is it wrong that we get rid of the kids first? Summer is also my favorite time of year!! Even if it is HOT! I love it. And roasting marshmallows is a family favorite thing to do especially if we have alot of kids over. I have never tried these logs, but WOW! what a great way to get a fire going quickly. I am sure it beats the alternative. THanks for sharing. Now I want smores too!! Wow I love these, had not seen them before. With everyone using gas and charcoal now we miss out on toasting marshmallows. What a great way to do it.